While making twitter connections I can across @WillowRaven . She offered me this visual writing prompt. I looked at it and remembered one day while I was in the shower after a hard day working for Xbox and talking with gamers, I had the words of what could be a song rolling around in the old noodle so I wrote it down on a little notebook. Not really thinking I would ever use it. The original work is a bit dark because it was kind of in the mindset of a rpg game, but I have lightened it up a bit changed a few words and think the part I am sharing below might work out for this challenge. I guess I will go with a bit of a futuristic, sci fi theme..... what do you think? This is my muse. Gorgeous design, Right? Here goes nothing. Remember, I am a reader, not a writer. 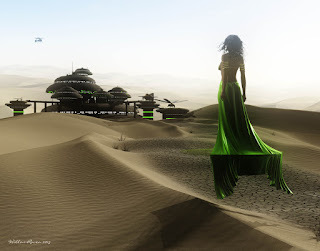 Avaena arrived on the desert world of Koorvas weary, hungry and alone. The battle on her home star had been raging for weeks and now in utter chaos, the once beautiful star was in ruins. A dark shell in the cosmos, death and destruction gutted the very life force from the powerful star. She and a handful of fugitives managed to access the world portal before it collapsed. But something was terribly wrong. This was not the sister star they were trying to make it to. This was a barren place. Where were the others? Aboard her veer, she started the journey toward something small in the distance. Her veer would hopefully make the distance, it's power supply was not at capacity. The sand beneath here looked deep and hot. Avaena was angry that her life had been turned upside down in a matter of days. Now she was alone, wandering on an unfamiliar planet, about to face Hanas know what. She sent a silent prayer to Hanas for protection. Her creator had never forsaken her. Blessing her with special gifts, rare talents and beauty, Avaena was powerful and dangerous. A single bloody tear dripped down her face. Angrily, she swiped it away. The blood touched the sand behind her, turning into a small diamond. Avaena never noticed. She was far too busy trying to make out what was now looking like trees in the distance and the thing hovering in the air beyond it. Closing her eyes for a moment brought back flashes of fire, screams of pain, Powerful remnants of dark magic and blood. So much blood. There would be more. There was no time for rest, no time for tears. She would make this place her home for now. The utter dominion of this barren place would undoubtedly bring more loss. A tearing down to build up in her own image. A blank canvas to create her kingdom until her star was ready to once again receive her back home. The citizens of Koorvas had no idea of the tragedy that was coming for them. Why had Avaena returned to Dune Towers?